Most gardeners get followed around by a chirpy robin. So why do I get the chicken? Yes I would definitely take the chicken! Here it’s Canada geese who object to dogs in the garden. Are they chicken manure pellets????!! Actually I was using them yesterday, but not at this precise moment! Cos you’re on the other side of the road…? 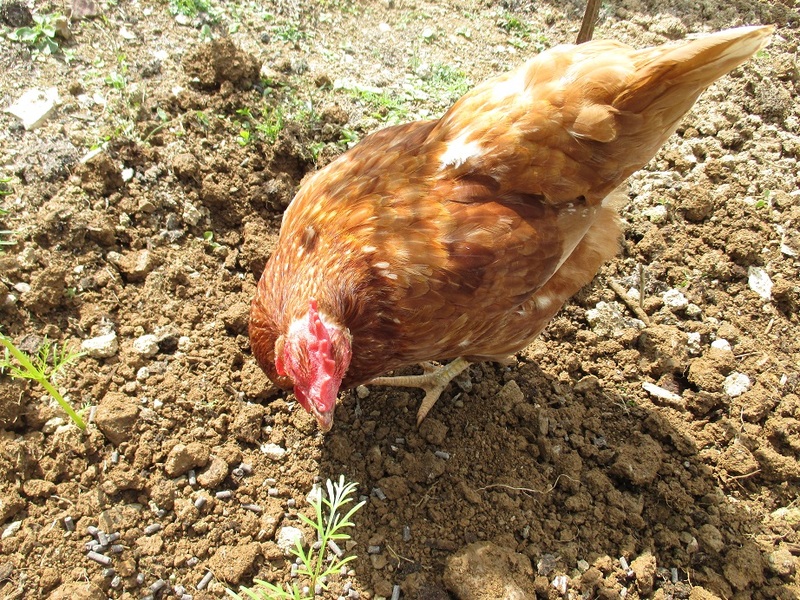 Perhaps they think you will dig up some tasty morsel for them – slugs?? I think she was eating the bugs and hopefully some slugs. Did you make it to Rosemoor last weekend? Yes, more pots of plants…!!! I love the idea of a minature pony following me around. Perhaps we can work on that! Ha ha. I hope that chicken has a gentle disposition. She is fearless and ignorant of what “shoo” means. Apart from that Gertie (as I have decided to call her) is of a very good disposition.